and I continue to be amazed by the impact it makes for those who install it. This system really works. The best part... you don't have to just take my word for it. 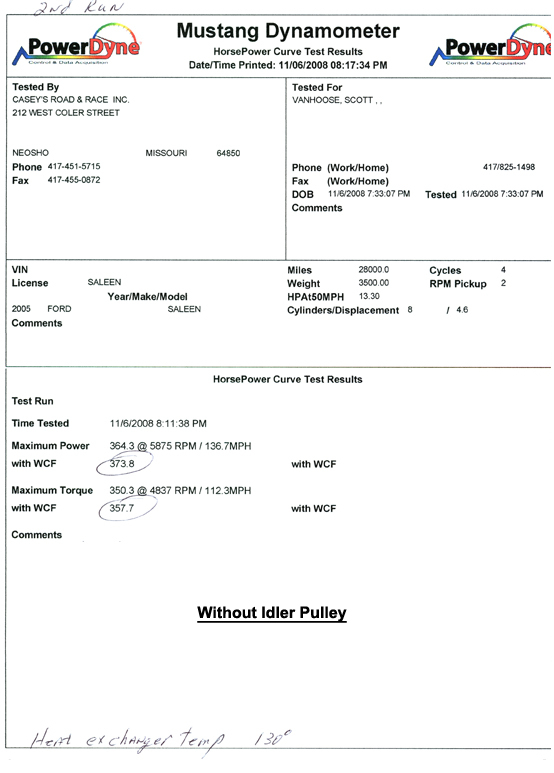 My idler pulley systems continue to showproven gains in horsepower and torque when compared to stock Saleen systems, even when the tests are completed back to back. Customer satisfaction continues to be overwhelming and we look forward to hearing the results of each pulley system we sell. Would you like to share your results with other Saleen owners? Contact us and tell us about your own experience with the MoSaleen™ Idler Pulley System! These Dyno sheets say it all! Dyno Run #12 utilizes our Stage 1* kit with BOTH the Idler, the 5.50" water pump pullet and the short belt. (40 RWHP Gain). *Stage 1 kit consists of a new intake system, custom tuning and a smaller blower pulley. 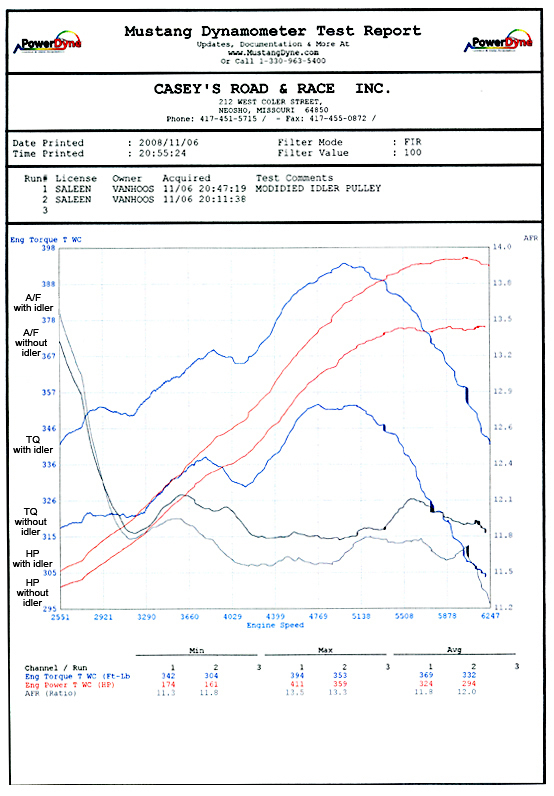 3.24"
** Troyer has recently run testing for a shorter belt by itself. This change added nothing. They have done this many times in the past, and a shorter belt only helps if you have enough belt "wrap". 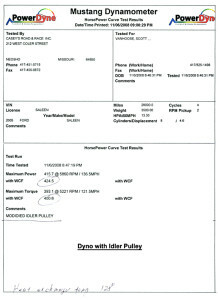 These dyno sheets are from one of my customers who owns a 2005 Saleen with a Series VI Supercharger with a 3.50 S/C pulley. 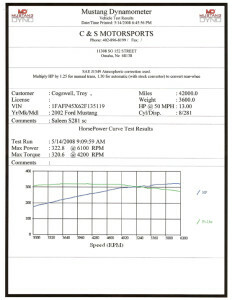 Prior to installation he was pulling 325 rwHP and 355 rwTQ. 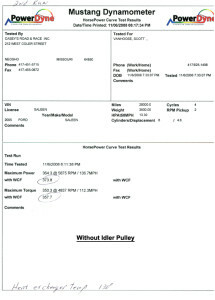 After installing the MoSaleen™ Idler Pulley System he experienced a power gain to 415 rwHP and 381 rwTQ! 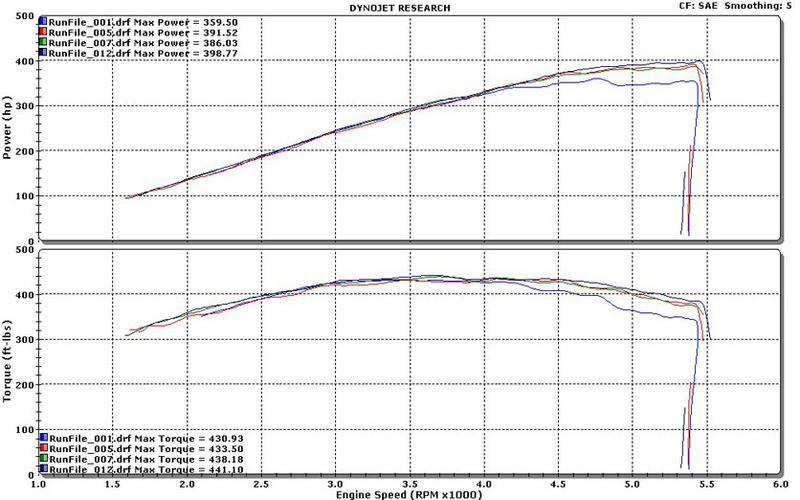 These dyno sheets are from one of my customers who owns a 2002 Saleen with the Series II Blower running 9lbs boost before the Idler vs 11lbs boost on the post-Idler setup. That’s about 2lbs boost gain shown by looking at the power under the curve! 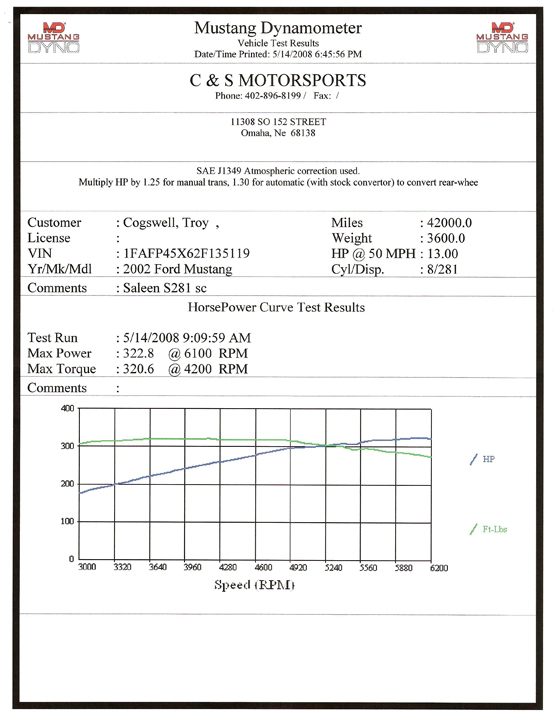 This comparison dyno sheet is from my 2005 Saleen, which has a Series VI Supercharger and a 3.20 S/C Pulley. 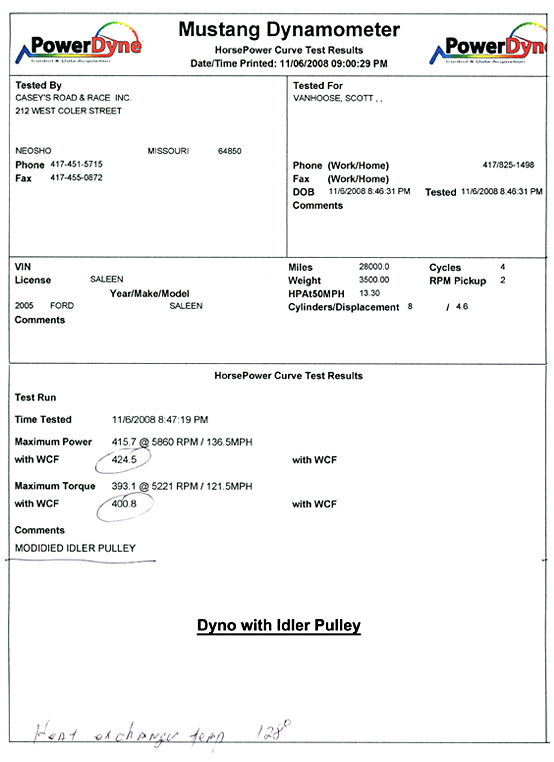 The dyno sheet shows the Horsepower, Torque and Air to Fuel ratio difference, running with and without the MoSaleen™ Idler Pulley System. 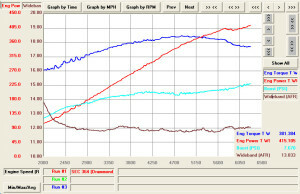 Notice the substantial increase in the Air to Fuel ratio, which generally results in the need for a retune. It is HIGHLY recommended that you check your air to fuel ratio after installation to be safe. 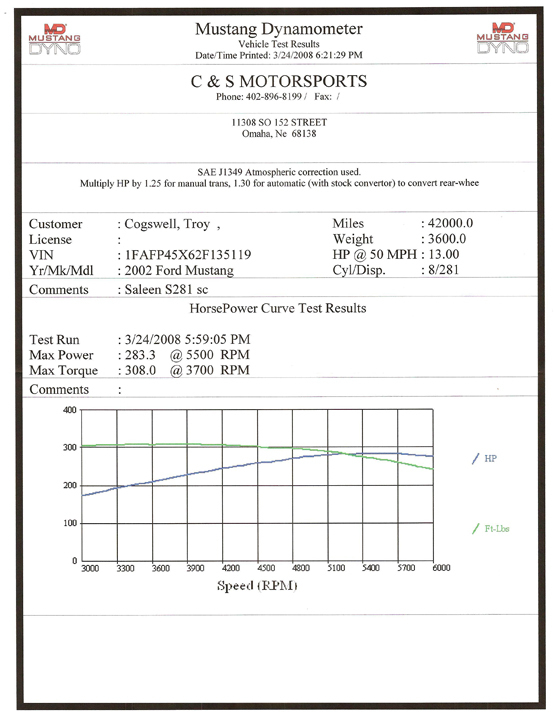 We do not recommend running more than a 12.0 to 1 air to fuel ratio on a supercharged Saleen. These back to back dyno runs, completed with and without the MoSaleen™ Idler Pulley System, resulted in a 51 rwHP and 43 rwTQ gain! "I have been running your pulley system on my car and I’m very happy with it. Not only does it look great but it performs quite well. I run a slightly smaller pulley (2.9) and I can get 10 pounds of boost out of my SC. The best thing about your pulley system is the low rpm, around 2500. If I just floor the car at the low rpm my boost jumps past 5 pounds like now, no real waiting. Your pulley system is the best mod that I have made on my car at this point. 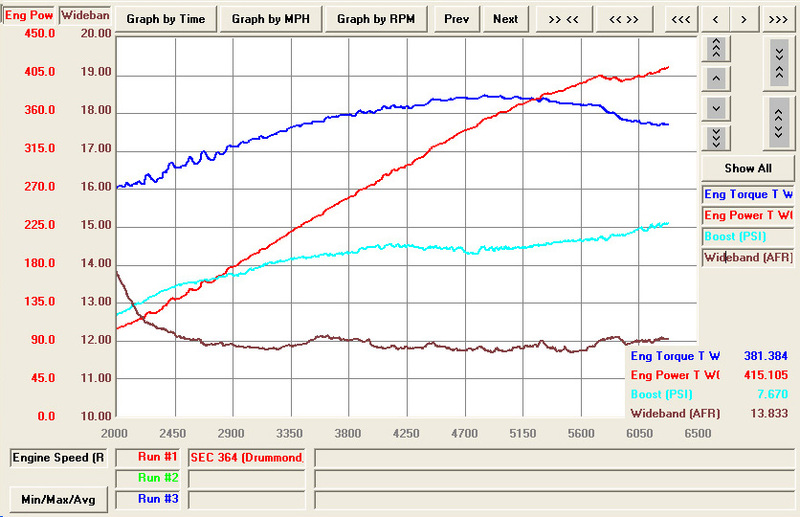 The day I put the pulley system on my car I noticed the difference in power. I would highly recommend your system to anybody with a 2004 Saleen SC. I now have a small list of mods, 2.9 pulley, MoSaleen pulley system, JLT cold air intake, TR6 plugs, 42 pound injectors, 90mm MAF and a tune by JDM. I can honestly say the pulley system works and works well." "I wanted to let you know that I've put the pulley on my Roush and the result is more then satisfactory. 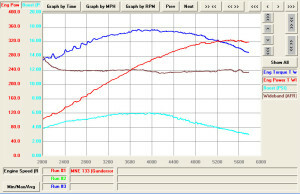 The car has changed its character of performance... much more HPand TQ. My degree of satisfaction is 100/100. Value for money and speed of assembly very very very good. Thank you very much Scott !!! 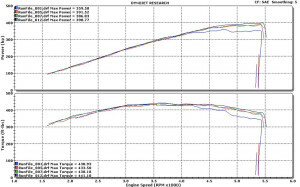 Note: A ++++++++++++++++++++++++++++"
slip, and helped with throttle response quite a bit! I personally could not have been happier." craftsmanship was flawless. Not to mention, Scott's great to work with and very helpful." the idler kit on I now see 9.5-10 pounds. The car definately pulls harder on the top end now." the supercharger's not putting out 100%? "Hey. I wanted you to know that it works. I made 2 more lbs of boost and not even a bit of belt slip. I'll have in on a dyno next week and send you the results. Thanks man!" "My car is a stock 2013 gt with an as-delivered FRPP 624hp whipple supercharger kit. It has no additional mods. The pulley size is 3.375". Before the Moboost idler, the car registered 7-9 pounds of boost on the gauge, depending on what gear you were in, traction, and temperature. I would notice less boost when the car was cooler, and more once the belt heated up. Boost would spike to around 9 and dial back to around 7 once rpm came up. I would always have evidence of belt dust on my supercharger pulley, and sometimes smelled rubber burning after the car was ran hard. I attributed all of these symptoms to belt slip, even though I am running a relatively larger pulley and low boost. 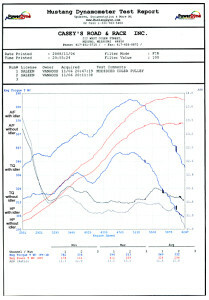 After installation of the Moboost idler, my car now registers 9-10psi in any gear, at any temp. I no longer see the boost fade as rpm rises. Boost ramps up much quicker than before. I can definitely feel a seat-of-the-pants power gain. I haven't had an opportunity to get the car to the track or on a dyno, but I improved my best "Track Apps" time by 2 tenths on the first try. The Moboost idler took 10 minutes to install by myself, with common hand tools. I highly recommend the Moboost idler as an addition to the Ford Racing supercharger kit!"